In Bhutan, you can shop for colorful masks, hand-woven bamboo items, wood carvings, stamps (great collections), silver, silk and bronzes. Handmade paper products, Buddhist paintings and religious thangkas are also popular items. Go to weekend market in Thimphu and you can see what you can find. Some popular handicraft items available for purchase are hand-woven textiles of raw silk or silk, carved masks of various animals, woven baskets of cane and bamboo, wooden bowls known as Dapas, handmade paper products or finely crafted gods of silver. Other items you may be interested in are the exquisite Buddhist thangkha paintings or Bhutan’s wide array of colorful and creative postage stamps. You can come across these items in the many handicraft shops in and around Thimphu and in other major towns. Please remember that buying and selling of antiques is strictly forbidden in Bhutan. Bhutan’s currency is the Ngultrum (Nu.) It is at par with the Indian rupee which is accepted as legal tender in the country. 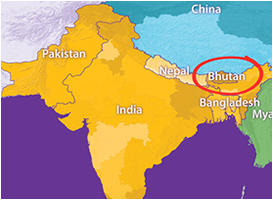 Note: INR (Indian Rupees) denominations of 500 and 1000 are not accepted in Bhutan. ATM’s are located within all main towns throughout Bhutan, where money can be withdrawn using a Visa or MasterCard. For concerned travelers a list of ATM locations throughout Bhutan is found here: BHUTAN ATM LOCATOR. In addition, POS (Point of Sale) services are available nationwide, meaning visitors can pay by credit card at most hotels and handicrafts stores. Financial institutions in Bhutan have been greatly enhanced and today we have a number of banks that cater to the needs of the people. Some of the banks that you can avail of while in Bhutan are the Bank of Bhutan Limited, the Bhutan National Bank, the Druk PNB and the Tashi Bank. Traveler cheque can be easily withdrawn and exchanged for local currency. Many of these banks provide internet banking facilities. Copyright © 2019. World Tour Plan. All rights reserved.